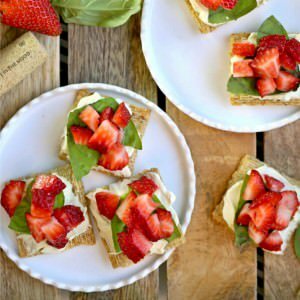 Look no further for a simple and delicious appetizer like Strawberry Mascarpone Triscuit Bruschetta for a perfect pairing with your favorite white wine! Spread 1 tablespoon of mascarpone on each of the two Triscuit crackers. Top each cracker with a basil leaf, and then 1 tablespoon chopped strawberries. Enjoy paired with a glass of your favorite white wine if desired!